The upgraded version of luxurious compact SUV X3 from German car maker BMW has been in lime light from quite some time. 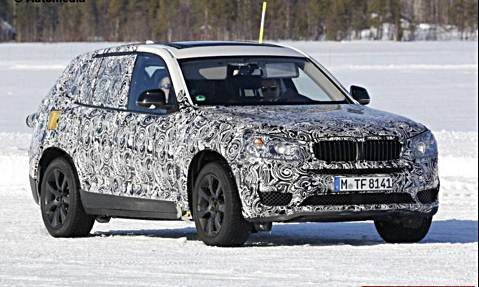 Recently spies have witnessed the completely camouflaged trim of generation next BMW X3 codenamed as G01 being tested on roads. The spied version of vehicle was its proposed upgraded version BMW X3M which is developed on CLAR design philosophy and expected to make its debut by the end of next year or in beginning of 2018. In its next generation the upgraded BMWX3 will carry the DNA of its ancestors in form of rear wheel drive option. The praise worthy feature will be integration of xDrive all wheel drive system that will transit power to rear wheels. Moving towards technical aspects in its new avatar the X3 version is speculated to carry most features from latest 7 Series along with fleet of remarkable features outsourced from various member of BMW family. Talking about the new introductory trim X3M it is said to bestow dynamic and aggressive appearance than compared to standard BMW X3 version. The major attractions would be enhanced wheel arches along with improved body appearance. Although there is long time to go in its launch but once launched in global market it will be join the family of X5M and X6M.